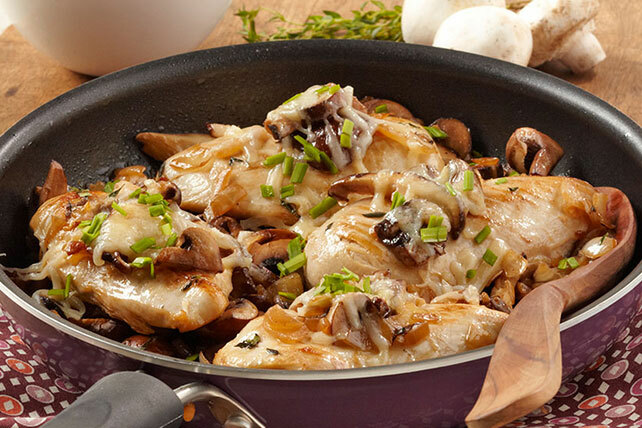 Develop layers of flavor, all in one pan, with this Chicken and Mushrooms Skillet recipe. This chicken-and-mushrooms dish is as elegant as it is easy. Cook mushrooms and onions in large nonstick skillet on medium-high heat 10 min., stirring occasionally. Add dressing, garlic and thyme; cook 5 to 7 min. or until mushrooms are tender, stirring frequently. Transfer to bowl; cover to keep warm. Add chicken to skillet; cook 5 min. on each side or until done (165ºF). Top chicken with mushrooms and cheese; cover. Cook 2 to 4 min. or until cheese is melted; sprinkle with chives. Prepare using 2 pkg. (8 oz. each) sliced fresh mushrooms. Substitute 1/2 tsp. dried thyme leaves for the fresh thyme.